I absolutely love creative people, and Cindy Cloward is high on my list. She is a top star in the sewing industry with her clever fabric designs and insight into children’s clothing ideas. The name Riley Blake is not only the name for her company but has become the call sign for her fabrics in the sewing world. It is not uncommon to be in a fabric store and hear the question “Where are the Riley Blakes?” or “Do you have the new Riley Blakes?”. When my granddaughter was born, my sewing interest turned to fabric styles like these that are trendy but gorgeous. Cindy is a busy mom and wife as well as an astute businesswoman. Phyllis: Riley Blake is a legendary name in the sewing industry. How did you get your start? Cindy: My husband, Bret, grew up in the fabric world. His parents owned several fabric stores in Utah. He worked at his parents’ stores from elementary through college. One of our dates was actually doing inventory at his dad’s fabric shop. It was great fun to have full access to all the fabric I wanted through their store, Family Fabrics. My wedding dress, plus the entire party of bridesmaids’ dresses was made from fabric from their store. Bret never thought his career would turn full circle and he would be back in fabric after spending 15 years as an executive in the wireless market. Until that point, my career had been in nursing (I was a labor and delivery nurse for 10 years and took an early retirement to raise my children). But, a family crisis brought Bret and I back to Utah from New York to run Christensen Wholesale. We decided eight years ago to begin manufacturing our own flannel fabric lines for a niche market. Seeing our success in flannels, we saw a need for bright, different, fun fabrics in the quilting industry. Riley Blake Designs launched its first line in the spring of 2009. Just Dreamy was our first line. Five years later, we are featuring Just Dreamy 2 at the International Quilt Market in Pittsburgh this May. What was your inspiration for the name Riley Blake? As a tribute to the rising generation of fabric lovers and ones who have passed on, Riley Blake Designs was named after our daughter, Riley, and Bret’s dad, Blake. Bret’s father passed away in 2002, and I think he would be amazed and proud of what we’ve built in the past 12 years. When did you know your business was a success? What was that defining moment? The International Quilt Market in Salt Lake City in 2010 was our defining moment. We were able to showcase what we had built in Riley Blake Designs. There, in our home state, we showed what we were all about, and we got to share that success with all of our employees, family, and friends. As a sewist, I love your fabric designs. How many do you design yourself, or do you source artists for your fabric designs? We have over 30 different fabric artists that we work with at Riley Blake and Alpine Fabrics. Jina, our design director, and I work with our artists very closely to get their artwork ready for fabric. Jina and I also work with graphic artists to create Riley Blake basics. What is your greatest challenge being a woman in business? Not enough hours in the day! Balancing family life with work life is a challenge. We launched Riley Blake when our youngest child was starting kindergarten, so it was a good time for me to refocus my energy from home to the new company. Now, however, handling the growth in our business can be all consuming. There is always one thing left to do. My husband and I have learned we just have to walk away when it’s family time. We have to be done for the day. It helps that we have learned to rely on others. We have such a great staff of employees that care about Riley Blake Designs as much as we do. I try to remember that at the end of my life I will not wish I had worked more hours, I will wish I had spent more time with my loved ones. I no longer feel guilty about having someone help me with my house. It makes the time I have at home with my family better and more enriching. I take my kids to school in the morning, and my husband or I are home when they come home. We feel it’s important for one of us to be there, so we work it out between us; if someone is working late, the other is home. Bret’s mom and my parents are wonderful and will stay at our home when we are traveling together. We have three children living at home now. (Altogether, we have four children, three boys and one girl.) This spring, Riley will graduate, so we will have two in college. It’s a transition time for our family. Soon, we’ll have only two kids at home! Change is good but not always easy. How many fabric lines do you introduce annually? We introduce 50 new fabric lines a year. I noticed in your online catalog (great idea!) that you have a line of upholstery fabric. When did you start this? Is it a heavier fabric with the same designs as the quilting and sewing lines? We shipped our first home decorating line early in 2014. It is 100% cotton duck. You will recognize many favorite prints in home decorating that we have previously run in cottons, but there are new prints, too, that are exclusive to home decorating. From what do you get your inspiration? At home, I love to spend time in my sewing room. It is one of my favorite rooms in the house. It has pink walls and pink cabinets, which is my favorite color. 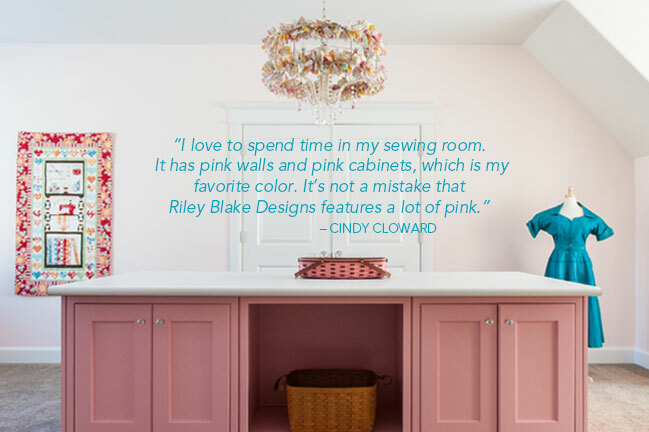 It’s not a mistake that Riley Blake Designs features a lot of pink. The room has an adorable chandelier embellished with our fabric hanging over my cutting table. I get inspired there, surrounded by my favorite things and a beautiful view of the mountains. I also gather inspirations from travel. I have been fortunate to travel to many different places on behalf of Riley Blake Designs. I always get inspired by the places we visit. It helps me see what is out there! This past year, I have been to Australia, New Zealand, Germany, Austria, Czech Republic, New York, Las Vegas, California, Portland, and Houston. It isn’t hard to find inspiration in such beautiful places. This week, I was especially inspired by a woman named Ruth Brusher. Ruth has dedicated her time to making teddy bears for abused children. 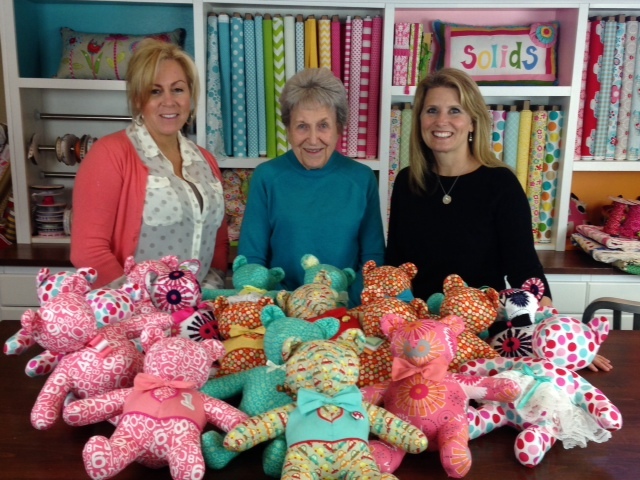 After 23 years, Ruth and her sewing friends have made 20,000 bears to give to the Utah County Justice system. Ruth said that she would be glad not to make another bear if that meant that there were no more abused children. But as long as there are abused children, she will be making bears. I felt really honored to be able to support this woman’s great, ongoing cause. Where are your fabrics sold? We sell to independent quilt shops in the USA from Christensen Wholesale, which is our business that we bought in 2001. Christensen Wholesale has been in business for over 80 years. Abroad, we sell to distributors that sell our fabrics all over the world. There is always room to grow, but we find great satisfaction here and now in the fact that our fabrics can be found in more than 40 different countries. What makes you tick and brings you joy? Being creative and trying new things. Whether that is sewing, decorating, gardening, or working on a photo shoot, I find a lot of joy in creating. And I love to see the successes of my children. They are such individuals. They are definitely the best things I have ever created. What would you want other women to know about you that would bring them hope and inspiration? I am a better wife, mom, and business owner when I have personal balance in my life. What that means to mean is that I try to take care of my body, mind, and spirit. I have recently taken up yoga, and I love it. I love learning and trying new things. And I love my quiet moments, especially early in in the morning when everyone is still sleeping. Those are times when I have time to read something inspirational, pray, or just think about my day. My faith keeps me balanced. We always want to have an eye for what is new and exciting and hope to continue making more beautiful collections of fabric in 2024! An absolute delight to read and feel this beautiful lady’s heart. Cindy’s passion for everything she loves can only be measured by the heart she shares with so many. Thanks for a great story. 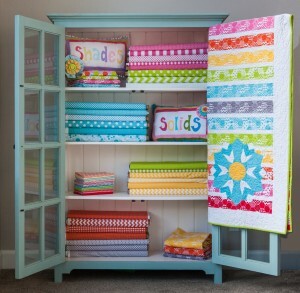 I am LOVING the quilt on hanging on the door of the shade/solids cabinet above. Is there a pattern available somewhere? Thanks again. What a great story, thanks for sharing it. Loved this article – thank you! Cheryl. Very good conversation .enjoyed her honesty. I loved this post! Because sewing is something I enjoy. I don’t have an elaborate sewing room. But maybe someday I will. And when she spoke of family and home, that touched me. So glad I get your posts. Thank you so much for this article . I was such a joy to read. I love their fabrics! Even more so now! I just returned from Houston, TX. where I hear there are a lot of quilters. A couple of my friends love to quilt. I am excited about your new line of fabic and can’t wait to see it. http://www.pennyrosefabrics.com check out her new fabrics! 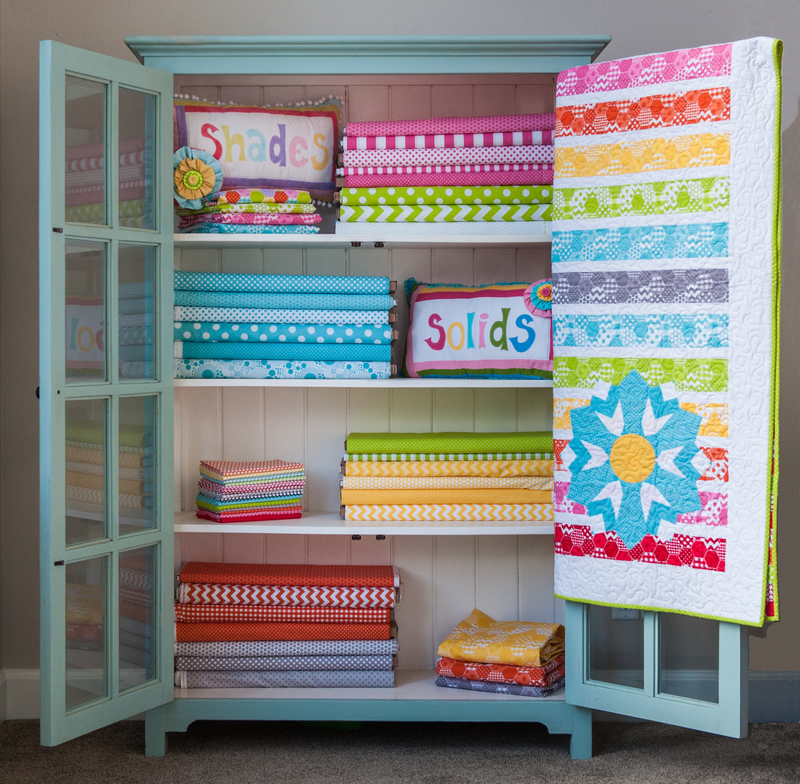 I’ve used Riley Blake fabrics in quilts for my grandchildren. They are happy fabrics that make me smile. Thanks for introducing me to the woman behind the work! Thank you for introducing me to these delightful fabrics! I’m already making plans to try making a quilt for my daughter’s first year at college. She’d so enjoy the dots, the chevrons or the Union Jacks designs. What an inspirational woman. She combined love of family with her business to create lovely fabrics.